Ahmet Lihic was eight when he kicked his first real football on the sports field of SOS Children's Village Gracanica in Bosnia and Herzegovina just a few days after he found his new home in the family of SOS mother Alma Maglic. Today, at 22, Ahmet plays football at a professional level. After Ahmet's parents separated the boy came to live in the SOS Children's Village in Gracanica. At first, he was a sad boy confused by his new circumstances and unsure how to adapt to his new life. Football was the only constant thing in his life. His SOS mother Alma recognized this and encouraged Ahmet to use football to bond with his new siblings on and off the sports field. "I think Ahmet was born loving football," says Alma remembering Ahmet's childhood. "He infected us all with his passion. Our whole family started following the matches of the national football team." As any mother, she insists her boy is more than a football aficionado. "My Ahmet has always been a modest boy. He has never bragged and still does not about his talent and skills. He was a hard-working student who never neglected his school obligations and home chores. When we lived together, he was my right hand," says the proud SOS mother. Outside school, chores and sleeping time, Ahmet would most often be seen at the village sports field. A little over a year later, Ahmet told his SOS mother that he wanted to join the local club. "She signed me up, and I started playing more seriously at the age of ten. My first club was Bratstvo, the local club. I played there until I was 15," says Ahmet. At 15, when Ahmet finished primary school, he moved to the SOS Youth Home in the nearby city of Tuzla. "Tuzla is only an hour from Gracanica but for me it was a nightmare," Ahmet shares honestly. "I felt as if I was abandoning my family, my club, my local team. I quickly realized I am not abandoning anyone or anything. All is still mine, only now I have new and more opportunities. I enrolled in high school and joined the local football club." Ahmet moved up the junior and cadet teams of several local clubs and found himself a regular in the first team of football club Mladost Solina from Tuzla. 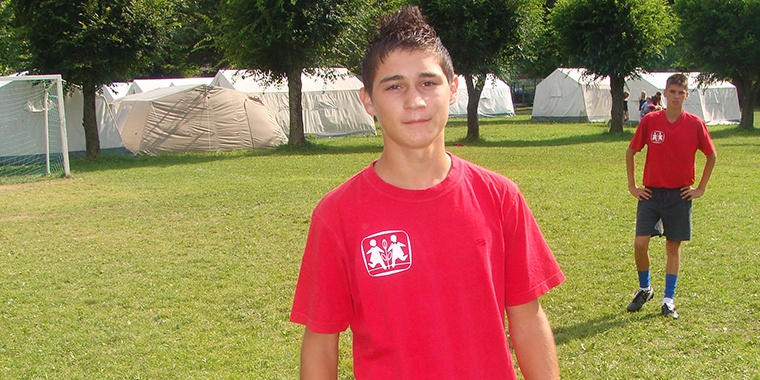 In May 2012, 16-year-old Ahmet was part of the team of SOS Children's Villages Bosnia and Herzegovina that participated in the European football tournament for children in care in Poland. Shortly after the tournament in Poland, he was invited to be part of the national team of Bosnia and Herzegovina in the Homeless World Cup in Mexico City. Ahmet was the only child from SOS Children's Villages in the national team. "It was unreal! Chile won, but we were excellent too." After leaving the SOS Youth Home, Ahmet went to Slovenia to visit his father's side of the family. "This trip opened new opportunities for me. I got few try-outs and was then signed to play in the football club Shoshtanj in Slovenia. Later I moved to [SK] Altheim in Austria and then [ND] Dravinja back in Slovenia." Ahmet's contract with his last club has just now ended, and he hopes the summer transfer period will find him a good football home. "Football is my passion and my life," the young man says adding that he would not be where he is had it not been for SOS Children's Villages. "I have many happy memories from my childhood in the SOS Children's Village. I have many friends with whom I'm still in contact today. Growing up in my SOS family made me a good man. My SOS mother is proud of my success, and I‘m happy to be able to show her my love and gratitude in this way." SOS mother Alma is now retired, but she says she will never retire from her role as mother to all the children she raised in Gracanica. Ahmet phones her regularly and visits her every time he is in Bosnia and Herzegovina. He often likes to visit the village and his childhood house in which now some other children grow up with another SOS mother. Ahmet never misses a chance to stop by the village's sports field where his childhood dream started.